The majority of CUNY students take classes part-night or at night, making it virtually impossible to cross the 30 credit threshold. Denise Romero considers her experience in the City University of New York system a “bumpy ride.” She first attended York College in 2010, transferred to Baruch College and was later dismissed, entered Kingsborough Community College, and eventually moved to her current home: LaGuardia Community College. “It’s the most horrifying rollercoaster ride I can’t get off,” she said laughing. Romero, from Mexico, is one of thousands of undocumented students attending CUNY, New York City’s flagship public institution of 24 senior and community colleges. These students pay tuition and related school expenses without being eligible for federal or state financial assistance, and, starting this fall, they are excluded from Governor Andrew Cuomo’s “tuition-free” plan. The Excelsior Scholarship affects colleges at both the City University of New York and State University of New York. It is the first in the nation to provide free education at four-year public colleges. Students from families that earn up to $100,000 per year would qualify under the program, eventually expanding to $125,000 by 2019. “There is no child who will go to sleep tonight and say, ‘I have great dreams, but I don’t believe I’ll be able to get a college education because my parents can’t afford it,’” Cuomo said after it was passed by lawmakers in Albany. However, the dreams may still turn to nightmares for many students. For one, students must take 30 credits, or about 10 classes, over the course of an academic year. Nearly two in five CUNY students come from families earning less than $20,000 a year (tuition is over $6,000 per year) and the vast majority are forced to work and take classes part-night or at night, making it virtually impossible to cross the 30 credit threshold. Governor Cuomo’s plan was rightly criticized by outlets such as the New York Times, which called it a “program for one slice of the middle class.” But even that is an overstatement. The plan would affect, at most, 5,000 students at a university system with nearly 250,000 students, including almost 6,000 undocumented students. (The Governor’s Office believes over 900,000 students in total will benefit by 2019, albeit admitting the plan may become a lottery system). 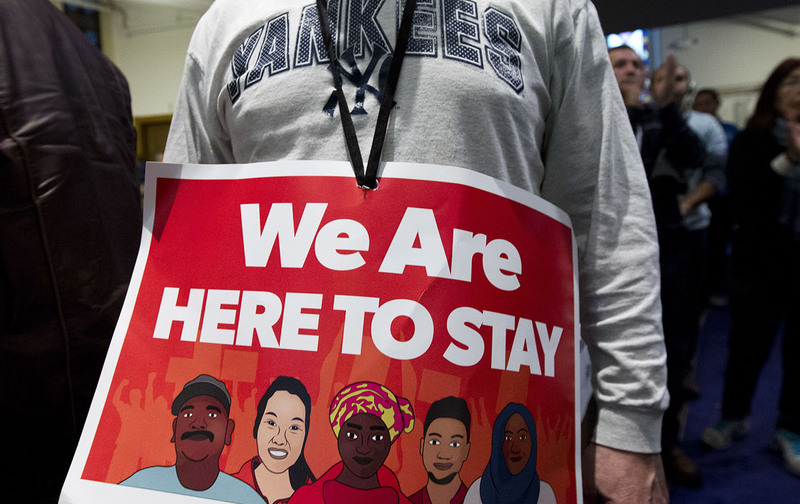 “It’s really great except that the plan doesn’t include a lot of undocumented youth as well as part-time students,” Guadalupe Miller, a student at Queens College said. Erik Forman, formerly a teacher in the CUNY Language Immersion Program, explained to The Nation that Cuomo’s plan is a “PR scheme” that fails to benefit students equally. It even imposes “a $1,000 tuition hike over the next five years,” pending approval by the CUNY Board of Trustees. “Of course, if you’re undocumented, you’re completely screwed. You get no financial aid, and [college] became $1,000 more expensive,” Forman, co-founder of the Campaign to Make CUNY Free Again, said. Romero also considers the plan’s general intention as helpful, but views it as political cover considering the austerity imposed on CUNY and Cuomo’s previous budget-cutting. “It’s really enraging from so many angles because Cuomo has vetoed and failed to pass the DREAM Act, which he promised undocumented activists during his [last] campaign…. It’s the policy that would have given students access for funding,” she said. In 2014, when Cuomo was re-elected governor, he promised to sign a state version of the DREAM Act that could help undocumented students. Despite passing in the state Assembly, Cuomo dropped his support and the measure narrowly lost in the state Senate by two votes. The governor still cynically supports it every year in his Executive Budget but has has invested little political capital to make it a reality. Cuomo’s plan also fails to address another serious issue at CUNY colleges—inadequate facilities. Brooklyn College—which reopened its cafeteria last year after an infestation of rats and roaches—is jokingly called “Broke-lyn College.” At City College, aside from the paint on the walls peeling, students wait around seven minutes for elevators, a problem especially inconvenient for disabled students (the college also reportedly struggled with a nearly $15 million deficit in 2015, and its former president is under a federal investigationfor misusing funds). All of this causes more headaches in an underfunded system. When he taught students at Bronx Community College, Forman recalled the door to his classroom not closing. Moreover, the windows did not close all the way, which would cause complications during the winter. “I would have to walk to a building next door to find a restroom that functioned,” Forman said. Romero shared similar experiences of her time at LaGuardia where its overcrowded library did not have a sufficient number of desks for students. CUNY does provide resources for undocumented students. It encourages them to apply to private scholarships and offers legal services through CUNY Citizenship Now! Muller recalled, when she attended Guttman Community College, the university provided benefits such as free MetroCards and stipends to undocumented students. Queens College, in contrast, does not offer as many resources, yet she is attending with a scholarship that covers her tuition and expenses. “At Guttman, I received a lot of help. At Queens, it’s very different. It’s a lot bigger, and it’s a bit harder,” she said. Romero, too, offered an example of a scholarship designated solely for undocumented students at LaGuardia. Yet she believed universities could offer more, such as mental health services for immigrants that face deportation raids. Since the election of Donald Trump, students and faculty waged demonstrations and created petitions on some CUNY campuses urging the administration to designate the institution as a “sanctuary campus,” allowing officials to not work with any federal authorities seeking to detain students. Regardless, such small victories should be recognized. “The small efforts in the CUNY administration to alleviate the obstacles undocumented students face has been won through the advocacy of undocumented students….and the empathy of adjunct professors, who have fought for some of these things,” Romero said. Romero intends to continue her studies for the next few years as she works full time at a legal service organization. “We all stand to lose a lot more if we don’t come together, fix these contradictions, and fight for true access and education,” she said.